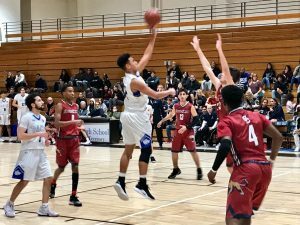 SANTEE – The Steele Canyon Cougars held off the late charge of the West Hills Wolf Pack, 66-65, for a key victory in the Grossmont Hills League on Friday night. The Cougars were led once again by the leadership and scoring of senior GRANT CHILDS. Childs had a pair of three-point field goals in the second quarter as the Cougars led 22-20 at halftime. 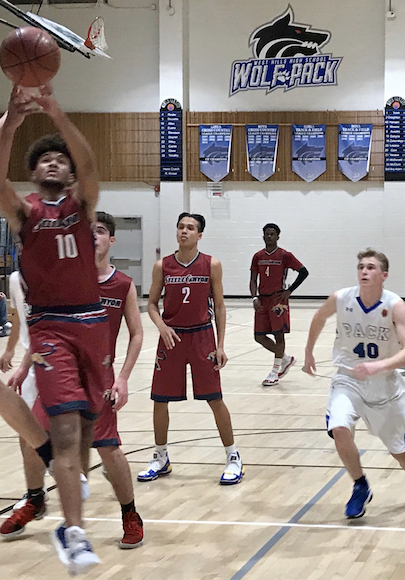 Steele Canyon was on fire from distance in the second half, making seven threes as a team, including more contributions from Childs. 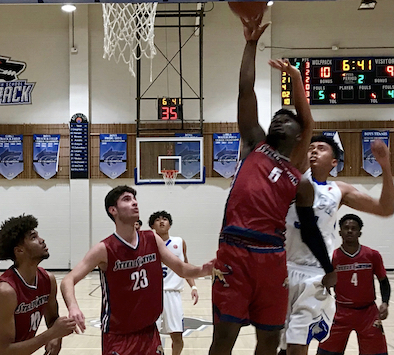 The play of the Cougars, including junior ALTON HAMISH and sophomore JOEY CLEAVES, help build a double-digit lead over the hosts in the fourth quarter. The fourth quarter was marred by an ejection to a Steele Canyon player for throwing a punch at a West Hills player. “I thought coaches from both sides did a good job to calm the situation,” West Hills head coach TIM BARRY said. “I think it was kind of chippy and physical during the game. I never expected that. West Hills was the team that took control from that point but just didn’t have enough time to overcome Steele’s lead. The incident likely led to the Pack’s momentum swing, although the atmosphere remained awkward throughout the rest of the game. Steele Canyon’s T-MAX NYUMAH had a key free throw with 7.6 seconds remaining. Sophomore guard CASH CREIGHTON had 14 points, including three three-pointers for West Hills. Junior guard JAYDEN MORENO added 11 points, and also had three three-pointers for the Pack. Sophomore KYLE DOBYNS contributed 10 points and seven rebounds for West Hills. West Hills senior MICHAEL MCDONALD had 10 points and six rebounds. Pack senior guard MICHAEL TOTAH had nine points and four assists. The win was big for the Cougars, who remained well alive in the Grossmont Hills League championship race. Their 4-2 league record has them one game behind leaders Mount Miguel and Helix. Steele Canyon will face Grossmont and the Matadors in their final two league games next week.